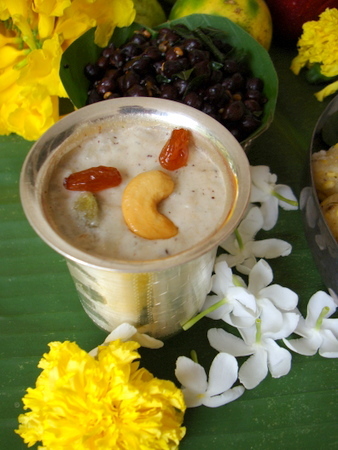 Atukulu (Aval) Payasam is prepared with rice flakes aka poha that is roasted in ghee, slowly simmered in a poppy seeds-coconut milk-jaggery base, flavored with cardamom and garnished with toasted cashew nuts and raisins. 1 Heat a pan, add a tbsp of ghee and toast the cashew nuts and raisins till golden brown. Remove from pan, keep aside. 2 In the same pan, add the ground paste and few tbsps water and cook for approx 4-5 mts. Add the jaggery water and let it cook along with the paste for 5-6 mts. 3 Add roasted rice flakes and coconut milk and let it slowly simmer for 10-12 mts, stirring it once in a while. 5 Add the cardamom pwd and toasted cashews and raisins. Serve warm or refrigerate until chilled. It tastes good both warm and chilled. – You will find that once you turn off the flame and the payasam sits, the rice flakes absorb the coconut milk and the payasam will thicken. The payasam thickens even when refrigerated. So at the time of serving, add some warm milk and combine well and serve. I’ve heard poppy seeds in payasam makes one high, is that true? 😀 Nice effect that is, eh? I will try this payasam today. photo is looking good. Thanks for the wonderful payasam, Sailu garu. oh, im going to enjoy this dish 🙂 as a child, ive always had atkulu in hot milk. what a taste! i like this pic a lot- the shining silver glass, the cashew color matching with the flowers and the red raisins are a contrast to the green banana leaf! Nice and thick pyasam…never made them with khus khus. Coconut milk and jaggery should have tasted even better. Your recipes are great and very nice presentation too!! Can this kheer be done without coconut milk too, or with some other equivalent ingredient? Thanks for sharing such wonderful dishes. Please keep continuing your posts, it really helps a lot and whenever I have any doubts and need any recipes, yours is the first site I refer too.. Thank you for your sweet words, TRS. You can substitute with milk. If you are using milk, you need to add it towards the end. Once you cook the paste, add the jaggery water and let it cook for 3 mts. Add the washed rice flakes and cook for another 3-4 mts. Add the milk and simmer for 4-5 mts. Add elaichi pwd and toasted nuts/raisins and turn off heat. You can substitute with melon seeds or just increase the number of cashewnuts to 10.
lovely post 🙂 YUM !